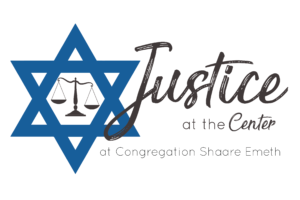 Justice at the Center is Shaare Emeth’s congregation-based community organizing initiative. Our first campaign, Vote Your Values, engaged over 200 volunteers and impacted over 1,000 congregants in the Fall of 2018. 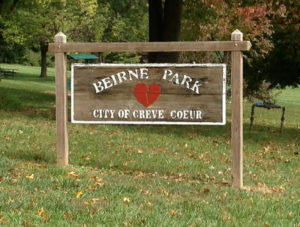 Have you ever visited Beirne Park in Creve Coeur and wondered about its unique location? During this forum we will learn the park’s history, how it plays into St. Louis’ historic racial divide and its connection to St. Louis’ current fair housing challenges. We will also explore ways that we might make a difference when it comes to the park’s legacy, as well as housing discrimination in St. Louis today. All who attend the forum will be able to share feedback on this next potential Justice at the Center campaign. Bring all of your Shaare Emeth friends. Everyone’s voice is needed! If you are unable to attend on May 6 but would be interested in learning more about this potential campaign, let Stacy Jespersen know ([email protected]). 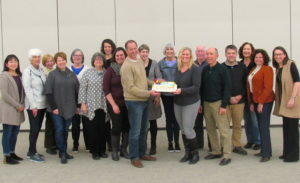 The Vote Your Values Committee celebrated the conclusion of the successful Vote Your Values Campaign with a reflection session and cake! 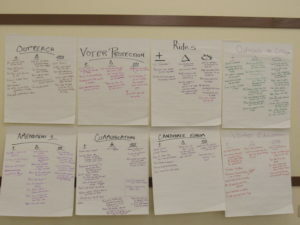 Reflections and notes from the Vote Your Values Committee celebration and meeting. 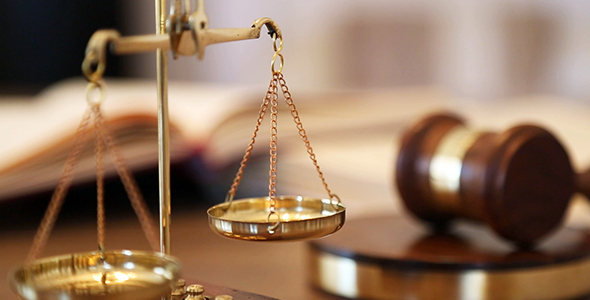 After conducing dozens of house meetings, listening to hundreds of congregants and researching a variety of campaigns, Justice at the Center has selected to join the Reform Movement’s national Civic Engagement campaign as our first congregation-based community organizing campaign. Click HERE to learn more about Shaare Emeth’s Vote Your Values. Shaare Emeth’s Justice at the Center initiative is a congregation-based model of community organizing that aims to address the root causes of injustice. It begins with relationship-building within our Shaare Emeth community. In this first phase of the initiative members sit face-to-face in house meetings listening to one another’s stories about the challenges we face, the injustices we see in our community, and our desire to work toward change. These stories are the building blocks of this initiative as they will help us determine which social justice issue we will tackle first. We have completed our Justice at the Center House Meetings. Thank you to everyone who volunteered to host a meeting and thank you to all who attended. When we look around at the world as it is, we know that this is not the world as it ought to be. There is pain, despair, poverty, injustice and brokenness. As Jews, we are called upon to partner with God in fostering justice and repairing the world in all the places that we can. Our texts call upon us to care for the stranger, the orphan and the widow – traditionally the most vulnerable members of a society, the ones who have the fewest resources and opportunities. We can offer this kind of care through acts of direct service, which are important as they allow us to provide help to others in an immediate way. Congregation Shaare Emeth is proud of our many direct service opportunities that we offer to our members. How is Justice at the Center different? Justice at the Center is a congregation-based community organizing effort, which is different than direct service. Through community organizing we are able to get at the systemic root of injustice, and ensure that there are systems in place to ease suffering and bring about greater equity and opportunity for people long-term. This initiative prioritizes relationship-building and begins with listening to each other’s stories. As we sit together in house meetings, we will hear about the brokenness we see in our own lives and in the lives of people in our city and state. We will take these stories seriously, as they will lead us to decide what issues we will tackle first. We will also hear stories of hope so that we might find strength in the faith we bring to one another. Sitting together, connecting with one another on a deeper level, will also enable us to feel more connected as a synagogue community. We will feel more compelled to show up for one another, and for the most vulnerable in our midst. More than 260 Reform congregations throughout North America participate in congregation-based community organizing. We are proud that Shaare Emeth will be the first congregation in St. Louis to take on this model. Our new bema (pulpit), situated in the center of the the Stiffman Sanctuary reflects our congregation’s value of placing justice at the center of all we do. The stone wall at the back of the bema is made of travertine cut from the side of a mountain in Italy. The blue glass on the front of the Aron HaKodesh (ark), designed by Ian Gilula, represents water–a powerful symbol in Judaism of both redemption and renewal. Taken together, the bema is a visual representation of the prophet Amos’ declaration, “Let justice roll down like water, and righteousness as a mighty stream (5:24).” It is our hope that all who enter our sanctuary will feel the call to justice and join with us as we work to create a world of justice, hope and peace. Rabbi Goldstein introduced the Justice at the Center initiative during Yom Kippur. You can watch her sermon below. We are grateful to the members of our Leadership and Facilitators Teams who have participated in trainings to learn the tools of community organizing.